These three gulls were all photographed in February of this year, the first one was at Starrigavan, the other two at Swan Lake. Unfortunately I neglected to get a whole body shot of this gull, so it may not be possible to identify it. 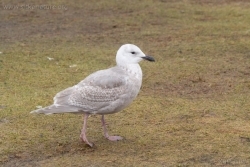 My best guess is Thayer’s Gull, but I’m not sure I can rule out a Glaucous-winged Gull with dark wingtips. The eye and head/bill structure suggest Thayer’s Gull to me. The wingtips seem very light. Perhaps pale wingtips are not too unusual in Thayer’s Gulls, however. I’m really not sure. Structurally this gull strikes me more as a Thayer’s Gull, but the coloring seems more typical of a Glaucous-winged Gull. Unfortunately I did not get a picture of this gull with other gulls of known identification, so it’s may be a little difficult to judge size. If I were just looking at the head, I would say my best guess is Thayer’s Gull. 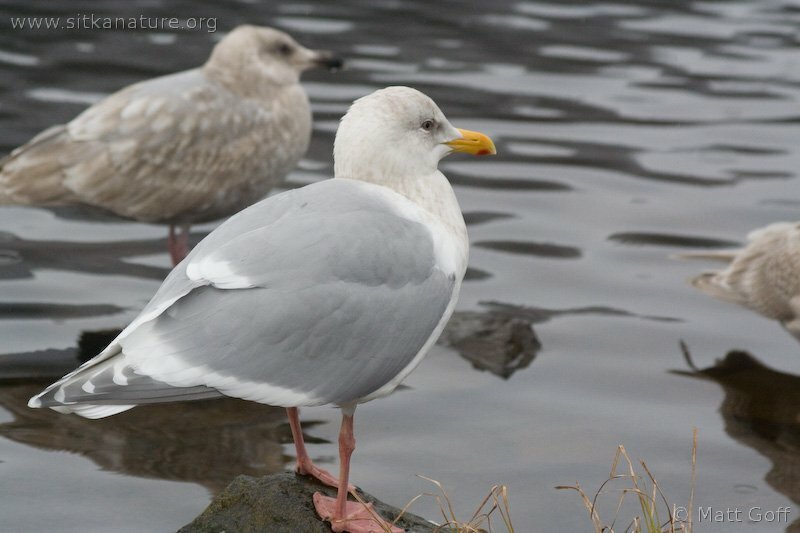 If I were just looking at the body, I would say Glaucous-winged Gull. As it is, I am uncertain. 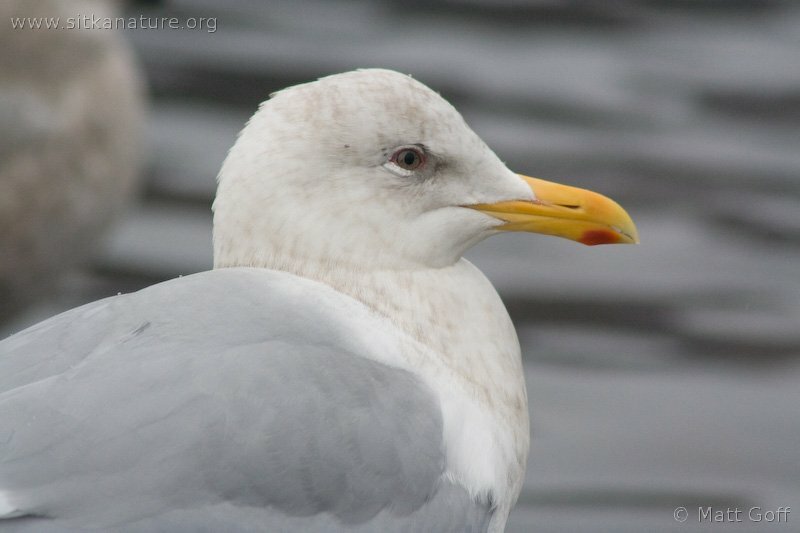 One striking characteristic of this bird is how bright yellow the beak is (that stood out at the time compared to other gulls as well). I think this is a Glaucous-Winged Gull. 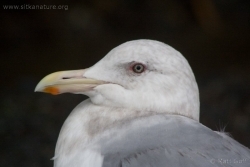 A lot of GWGU’s often have head and bill shapes similar to Thayer’s Gull. 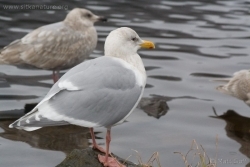 Some are even like Herring Gull in proportions. Sibley also notes this. A Thayer’s would show more black primaries on the closed wing when folded and view from the upper surface. That is if you’re looking at the wing closest to you. The far wing would not show any black on the underside of the primaries. 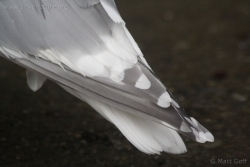 When the wings are open, the pattern in the wing of Thayer’s is still quick black but the black is restricted to the outer webs of the primaries and often there are large long tongues which end in a large pronounce whitish moon. This last characteristic is quite variable though. Some Glaucous-Winged Gulls can also have pale eyes, a few even paler than your bird. This bird above appears to have just very slightly darker the the mantel primaries which could indicate some hybrid gene flow in it’s past, perhaps with Herring Gull.